With championship aspirations heading into the 2019 NHRA Pro Mod season, veteran driver Steve Matusek today revealed a major partnership with Garrett Advancing Motion and its technology-driven line of turbochargers. Matusek will team up with the turbocharger powerhouse, adding a proven and innovative name to an already impressive list heading into the NHRA Pro Mod campaign. Matusek, who also joined Elite Motorsports' burgeoning Pro Mod camp in the off-season, will run Garrett Advancing Motion turbochargers on his Pro Mod Mustang as he enters the season with big expectations. "We want to work with companies that want to work with us and learn with us, and we have a great opportunity to work with a real high-tech company like Garrett Advancing Motion that will give us good feedback to advance our program quickly," Matusek said. "It's a very good, very safe product that will help us reach our goals and I'm very excited to work with Garrett in 2019." Boasting a long track record of success and a revolutionary line of turbochargers, Garrett Advancing Motion has been at the forefront of technology for six decades. Teaming up with Matusek and Elite Motorsports, as well as tuner Shane Tecklenburg and Modern Racing crew chief Justin Elkes provided another great opportunity for Garrett to dive into the NHRA Pro Mod ranks on a larger scale and showcase a turbocharger program that has been continually praised for its performance, efficiency and safety. "For us, it's extremely thrilling to partner with such a professional team and a guy like Steve with so much history in the sport," Garrett Advancing Motion Marketing Specialist Tim Coltey said. "This is the best of the best in the class and we're really putting the product to the test. It's a great opportunity to see what our products will do. It's really a big deal for Garrett to get involved at this level and it's definitely the right opportunity and team to be involved with. When you look at Steve and just the whole program with Elite Motorsports and Shane and Justin, it really was a no-brainer for us." Highly-regarded tuner Tecklenburg enjoyed previous success with Garrett turbos more than a decade ago, which only furthered his enthusiasm for the partnership between Matusek and Garrett Advancing Motion. "I'm super excited to be working directly with Garrett on a project once again," Tecklenburg said. 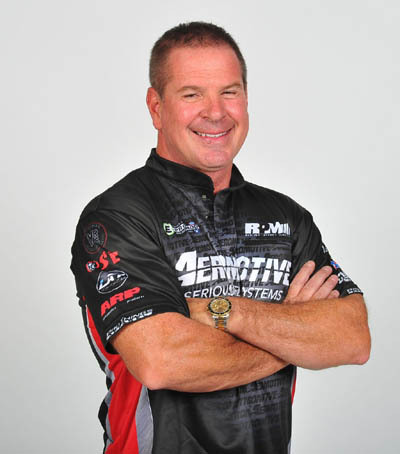 "I can't wait to go feed one of these Elite Performance, Alan Johnson Hemis with the new offerings from Garrett and start Advancing Motion." Matusek, who founded Aeromotive in 1994, recognized the innovation that has been part of Garrett's makeup for more than 65 years and also lauded the company's dedication to performance without sacrificing safety. He believes that bodes well for a season that has all the makings of a big year for Matusek. The E3 Spark Plugs NHRA Pro Mod Drag Racing Series presented by J&A Service starts in March at the Gatornationals in Gainesville, and Matusek is ready to start the partnership with Garrett on a good note at the first of 12 races in 2019. "They're concerned about more than just maximum performance," Matusek said. "They're not willing to give up safety for performance. Garrett has a product that can compete at a high level, but they also care about you and care about your safety. That's really important and I have so much confidence with the team and I believe, in a short time, the car will be near or at the top. I don't see how it can't be successful and that's what I'm expecting."